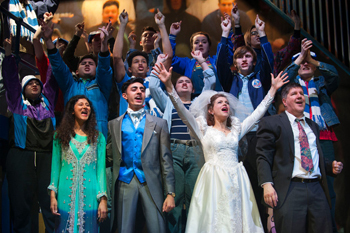 First and foremost, this is a play about football; the setting for the most part is a football stadium and when the action moves elsewhere, there is almost always a radio on hand (or even several radios) ensuring that the cast have live commentary of football matches, even if there happens to be a wedding taking place. Even the songs, or at least most of them, are about football (and the love of it). It is true that a certain romance develops during the play but even here, the love of football eventually surpasses everything; a telling example being when Mandi, the bride- to-be (played with feeling and gusto by Jenny Platt) after admonishing friends and family not to talk about football during the ceremony, eventually feels compelled to lift up her wedding dress to reveal a small radio attached to one of her garters. After being confronted with the play’s overwhelming football credentials, the issue becomes trying to establish what else the audience is treated to. There are clear parallels with ‘Fever Pitch,’ the Nick Hornby novel made into a film starring Sean Bean and just as that story centres on the importance of football to a community in Sheffield. So too does ‘Meat Pie, Sausage Roll’ - only for Sheffield read Oldham, only more so because if the audience is ever in any doubt that the play is about football in Oldham, the words ‘Oldham Athletic’ (at times illuminated) remain emblazoned in huge letters above the set through the show. The love of football seems challenged only by the love of Oldham Athletic and half the songs are simply love letters to this team. In fact, the importance of the ‘Latics’ for most of the characters in the story could fairly be said to encompass those of mining, brass bands and most else besides to the Yorkshire community featured in ‘Brassed off’. There is a basic story behind the football in ‘Meat Pie, Sausage Roll’, but it is the kind of very thin yarn that lies behind so many of the great Broadway musicals of yesteryear such as ‘42nd Street’ and ‘Me and my girl’. The plot is more as an excuse to present a set of songs and spectacle than provide the central reason for the existence of the show. Asif, played by Gurjeet Singh, falls in love with Mandi, but both of them, and almost everyone they interact with, also love football. Issues such as racial tensions, strained friendships and what really matters in life are touched from time to time but from start to finish, football remains the dominant theme. Mick, the central father figure, played convincingly by John Elkington almost teases the audience at one point into thinking they are about to receive an insightful gem of wisdom when he reveals that Oldham Athletic has a secret weapon in the championship success, only to give the answer to his enthralled son Kev (played with innocence and charm by Des O’Malley) as ‘The fans’! This seemed to sum up the simplicity of the whole show. 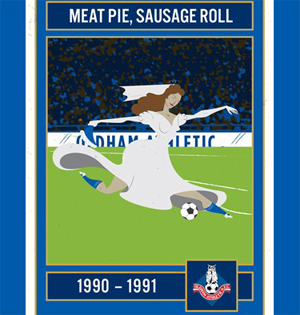 Perhaps the only time when ‘Meat Pie, Sausage Roll’ comes close to handling a real issue with gusto is when Jas, the sister of Gurjeet, played a nice hard edge by Yasmeen Khalaf, sings a song about how she simply does not get football, proving that it is actually possible to exist in this football-mad community without being completely football mad. Unfortunately, the chorus to Jas’s song is sung by the massed ranks of the rest of the cast and chorus about how they just love Oldham Athletic. ‘Meat Pie, Sausage Roll’ certainly has nice original music, written by Carol Donaldson (obviously not including ‘We all live in the Chaddy End’ sung to a well know Beatles’ tune) and the set is powerful - very visual and versatile. With good performances all round and an enthusiastic chorus, the passion of football is brought over convincingly with Jenny Platt giving a stand out performance. On balance, this show will appeal to football fans and most especially to football fans who support Oldham Athletic. It may also be of interest to sociologists exploring the importance of football and local teams in close-knit urban communities and possibly advertisers considering sports sponsorship but to anyone else, a word of caution; this show is about football, football and football, with a strong emphasis on football in Oldham. ‘Meat Pie, Sausage Roll’ is on until Saturday 25th March.